While the opportunity to break Banque Populaire V's record for the Jules Verne Trophy passed yesterday afternoon for Spindrift 2 and IDEC Sport, both boats look set to finish their respective non-stop laps of the planet tomorrow in highly respectible times, around two days short of the record. Since turning their bows on to the rough direction of Ouessant, the wind has been mainly strong (albeit for a slightly soft spell earlier this morning due to a fast-exiting area of high pressure developing to their south), but sadly dead downwind forcing the boats to gybe to reach the finish. Spindrift 2 gybed north yesterday lunchtime, just to the west of the easternmost Azores island, Sao Miguel, while IDEC Sport performed the same manoeuvre at around 1540 UTC just to the west of the westernmost Azores island, Flores. At present both boats are still on port tack heading NNE waiting for the wind to veer slightly so they can put a bit more east into their respective headings, setting them on a course towards southern Ireland, before they put in their last gybes for the Lizard-Ouessant finish line. 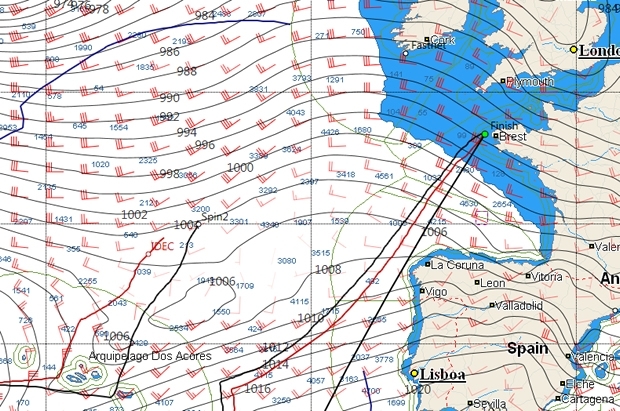 So, like Banque Populaire V four years ago, it looks like they will both be approaching the line at an angle of almost 90° from the great circle to the finish (ie directly up the Atlantic). Although the wind is softening slightly as they arrive in the Western Approaches tomorrow, the GFS model, at least, doesn't have the wind dropping much below 20 knots. Spindrift 2's crew is currently keeping an eye in the rear view mirror with IDEC Sport now just 90 imles astern of them in terms of distance to finish. However this is not a completely accurate picture, as correcting out the fact that IDEC Sport started before Spindrift 2, she is more like 143 miles astern both in terms of DTF and on the water in real terms. While at 0930 UTC Spindrift 2 had 699 miles left to sail and IDEC Sport had 789, given the angles they are sailing, they are both likely to have to sail some 80-100 miles more than this before they reach the finish. A personal challenge for Francis Joyon and the IDEC Sport crew - and one which they should comfortably achieve at this point - is to better the Jules Verne Trophy record time of 48 days, 7 hours 44 minutes and 52 seconds that Franck Cammas and his crew set on board their boat when it was Groupama 3 in 2010. This would require them to arrive before 09:47:14 UTC on Saturday. “If we get 100 % out of the boat, we can imagine crossing the line on Friday lunchtime. We’ll see how it goes,” stated Francis Joyon yesterday. Yesterday afternoon there were was also an option of continuing east towards Cape Finisherre, the northwesternmost corner of Spain. Here the sea state looked a little smoother but there was another risk: “After the front goes over tonight, there could be several hours of lighter winds. Getting stuck in a heavy swell with light winds with the sails flapping would be tough on the gear,” explained Joyon.